Six months ago, I was the first person to write about Free Oneways on United Awards. It is my most viewed post of all time, but it needs to be spruced up and to have the information from subsequent clarifying posts all put in one place, namely here. You must take your one free stopover per roundtrip international or Hawaii award at your home airport. You must route in a way that pleases the united.com computer. Exact routing rules are completely unknown. See I Don’t Know United’s Award Rules. You must follow all other United award routing rules. And as your reward, you will get one free oneway per roundtrip to anywhere in the same United zone as your home airport. If your home airport is in the continental US, that means you can get a free oneway anywhere in the continental US, Canada, or Alaska. You can take a cheap oneway to other destinations like Hawaii or South America. If you want to take your cheap oneway to a different zone than your home airport, you simply pay the difference in miles between flying home from your destination and flying to your free oneway’s destination from your destination. The free or cheap oneway will be in the same cabin as the rest of its direction, meaning if you have the free oneway before your outbound, it will be in the outbound’s cabin. Getting these free oneways requires taking advantage of United’s booking rules that allow one stopover and two open jaws for international awards from the US. And being able to book these free oneways online requires understanding how to book free stopovers online, so if you haven’t read my post on that subject, see How to Book Free Stopovers Online: United. Here’s the idea: you can use one stopover and one open jaw to construct a free oneway on an international United award or a United award to Hawaii. Andy lives in Newark, NJ. On April 10, 2013, Andy returns from Buenos Aires to Newark. This award costs 60,000 United miles and $79.82 in economy class because the continental US to Southern South America is 30k miles each way. On May 22, 2013, six weeks later, Andy flies from Newark to Chicago. <— Free oneway! By free oneway, I mean that the miles price hasn’t increased at all–it’s still 60k total miles. Taxes have increased exactly $2.50, the security fee for a domestic segment. This is a free oneway on a United award in its most basic form. Let me give you a ton more examples to illustrate the possibilities and answer your questions. Those of you who are familiar with adding free oneways to American awards know that to do so you must live in an international gateway city. One advantage of United’s free oneways is that you do not need to live in an international gateway city. Even if your home airport is tiny like Palm Springs, California, you can take advantage of free oneways. Economy awards between the continental US and South Asia–Honk Kong’s region–go for 32,500 miles each way. That means a roundtrip would be 65k United miles. Onto that, you can add a free oneway for zero extra miles. What if you live at a tiny airport that only has one United route like Charlottesville, Virginia, where United only flies to Washington-Dulles? You might think you can’t get a free oneway from here since you would have to transit Dulles twice in the same direction. To illustrate what I mean by transiting Dulles twice in the same direction, consider the example of Charlottesville to Paris roundtrip with a free oneway to Chicago afterwards. United considers the outbound Charlottesville to Paris and the return Paris to Chicago with a stopover in Charlottesville. That return transits Dulles twice, once on February 12 and once on March 6. Transiting the same airport twice in the same direction is completely legal according to United’s computer. The award prices at 60k roundtrip, which is the standard economy price to Europe roundtrip. Of course, Charlottesville is also served by US Airways, which could have been used to avoid transiting Dulles twice in one direction. But the point remains that you absolutely can transit the same airport twice in the same direction in service of a free oneway! In fact, I’ve even constructed awards that send the free oneway back to a previous layover airport meaning that you fly a route and its exact return back-to-back in the same direction. Here are some other awesome free oneways you can do with United miles. Taking a free oneway uses one of the two open jaws you get on United awards, but you still have one open jaw left. Feel free to use it by flying into one city and returning home from another on your main award. This award is business class from Newark to London, returning from Frankfurt to Newark. Then the free oneway goes from Newark to Phoenix. This is all perfectly legal and prices at the roundtrip business class price of 100k miles. This award also illustrates that international business class gives you the right to domestic first class within the US. That flight from Newark to Phoenix is in US Airways first class. Before the free oneway trick, you might have been tempted to fly Newark to London, London to Frankfurt, and Frankfurt to Newark on one award, using your stopover en route. That still might be the best deal–it depends on many factors, mainly whether you prefer London to Frankfurt or Newark to Phoenix in a premium class as a free flight because you can only get one of those on the award. For more info on this dilemma, see Choosing Between a Stopover and a Free Oneway on United Awards. Unlike American, United allows free oneways on awards to Hawaii! The main award above is from Los Angeles to Honolulu roundtrip. The outbound is in domestic first class, which costs 40k oneway to Hawaii. The return is in economy for 20k miles. The total price of the award would be 60k United miles for just Los Angeles to Honolulu roundtrip. As you can see, adding Chicago to Los Angeles in domestic first class doesn’t change that price. This award illustrates another important point about all free oneways. The airlines doesn’t see a free oneway at all. It just sees those legs as part of either the outbound or return. In this case, Chicago to Los Angeles is part of the outbound. Since the outbound is in domestic first, so is Chicago to Los Angeles. If we had made the free oneway in reverse, Los Angeles to Chicago after the Hawaii award, the free oneway would have been part of the return. The return is in economy, so the free oneway would have been also. When you are mixing-and-matching cabins, add the free oneway to the direction that is in a better cabin. This award also illustrates that United free oneways can be before your main award to your home airport instead of after your main award from your home airport. Free oneways are only possible when you take the extra legs within the same region as your home airport. Hawaii is not in the same United award region as the continental US. Neither is Argentina, but you can combine oneways to those places onto a normal award and reap big savings. When you add a oneway to somewhere outside the region of your home airport, you can figure out the price of the trip by checking out United’s interactive award chart. Adding a oneway to Maui onto a roundtrip economy award to Europe costs 2,500 miles. The award chart tells us why. If you’re contemplating adding a oneway, look up the oneway price for your outbound and return including your tacked on oneway. The outbound here is the mainland to Europe, which costs 30k in economy. The return is Europe to Hawaii, which is 32.5k miles in economy. That adds up (30k + 32.5k) to a total price of 62.5k miles, which is exactly what united.com charged for Newark to Frankfurt to Newark to Maui. To save you a trip to the chart, I can tell you that on a business class award to Europe, a cheap oneway to Hawaii adds 7,500 miles (57.5k vs 50k). On a first class award to Europe, a oneway to Hawaii is free because mainland to Europe and Hawaii to Europe are both 67.5k miles in first class. You don’t just have to keep your cheap oneway within the US though. You can easily fly down to another continent. Here is a cheap oneway to Sao Paulo after a Newark to Europe itinerary. Normally Newark to Europe roundtrip in coach is 60k miles, and Newark to Sao Paulo oneway is 30k in coach, so booking this as two separate awards would be 90k miles. But if you book this as one award with a “stopover” in Newark, the price drops by 12,500 miles! That’s a oneway to Sao Paulo for 17.5k miles. Using the same trick, you could add a cheap oneway to Central America for 2,500 miles or to Peru for 10k miles. What about to the Caribbean? The Caribbean is also a separate zone from the continental US for determining miles needed. But amazingly on the United chart, it actually costs fewer miles to get from the Caribbean to Europe than from the continental US to Europe. This is shocking considering the way to get from the Caribbean to Europe on the Star Alliance is by connecting through the US. Here’s a sample free oneway from the Caribbean to the US tacked on before the main European award. “Free” is a bit of a misnomer though, since adding the oneway actually decreased the price of the award by 2,500 miles! 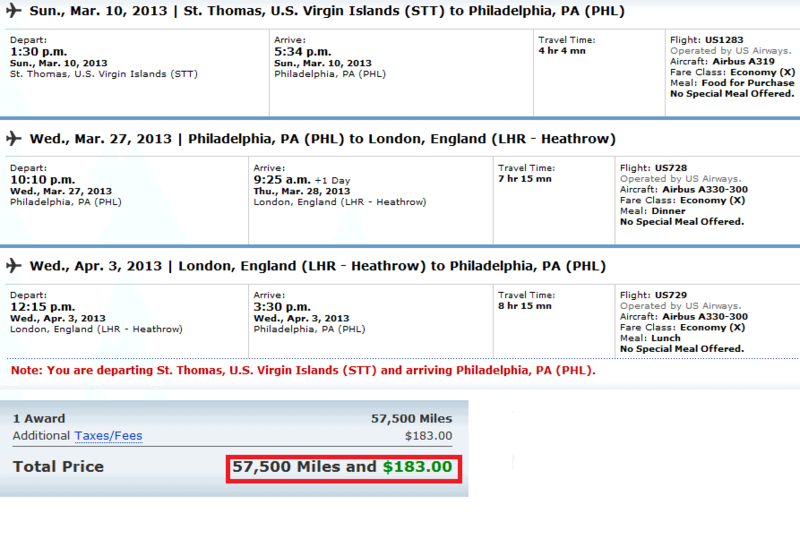 Take off the oneway from St. Thomas to Philly, and you pay 2,500 more miles. Nothing limits the free oneways to awards originating in the US or awards that touch the US. Here is an award with a free oneway that is wholly within Europe. Vienna to Madrid roundtrip then months later Vienna to Rome oneway for 25,000 miles in economy class, the normal roundtrip price in economy class. This could have value if you live outside the US or if you want a base to explore from on your next vacation. I made a YouTube video with that very title. You book the award exactly how you would book any multicity award with United miles, which I laid out how to do in How to Book Free Stopovers Online: United. The error may occur after clicking search, it may occur after picking the first leg, or it may occur after picking the first two legs. The error is caused because United’s search engine doesn’t show all the results that it should when you search multicity. From my experience, it will only show the first few results that I found by searching each leg oneway when I repeat the exact same search as part of a multicity search. For example, doing a oneway search of Hong Kong to Palm Springs on February 6, 2013 returns dozens of results, some near the bottom of the list with Saver (low-miles-price) availability. Doing the multicity search necessary to book a free oneway award that includes HKG to PSP on February 6 returns only three results, none with Saver award space. The cause of this glitch is unclear. The only way I’ve ever remedied this glitch online is to search each leg oneway and find dates that have availability for my desired cities, preferably availability on the shortest itineraries (the ones on top). But in most cases, if the glitch strikes, booking online is impossible. First, search for and reserve any United flight. if you reserve as much of your real trip as possible, you’ll save time, but you can literally put any one segment on hold, and this will work. Continue as if you are booking online all the way until the payment page. By clicking the link, you have reserved the award. You will get a confirmation number. If you look on united.com under your itineraries, you’ll see that your award is held until 11:59 PM two days later. Now you can call 800-UNITED-1 and change or add to the held reservation. Once the changes are made, you can ticket the reservation or hang up, in which case it would still be held until its expiration time. Make sure when you decide to ticket it that you say you are calling in to ticket a reservation you started online, so they don’t accidentally charge you a phone ticketing fee. Don’t let them charge you that fee because if they do–and they shouldn’t–it will be very difficult to get the refund you deserve. Phone ticketing fees are never charged to Premier Platinum members and higher. When the computer gives you an error message, you are in trouble. United does not post all of its award rules anywhere. Here are the posted rules. (Click the “Star Alliance air travel award rules” link. This means the computer rules all. If the agent gets an error message when trying to price all your award segments, he will be loath to overrule the computer. Instead he will backfill reasons why your award is not permitted. Most of these reasons, in my experience, will not be written on the linked list of rules. Some “problems” will be expressly permitted by the rules. For instance, many United phone agents have told me that you can only get one open jaw per award when the rules online clearly say you get two–and I’ve booked tons of United awards with two open jaws. What can you do? Don’t bother talking to the agent–he can’t change anything. Ask politely for a supervisor. Say you believe your award is legal, and ask him which rule it violates. Politely ask him to manually override the computer, and let you ticket the award for the correct price. If he won’t, then you should ask him to cancel the award. You can try to call back and get a friendlier supervisor, but the first one will have noted that your held award is not valid, so you need to create a whole new reservation. Persistence, politeness, and the fact that these awards are legal will help you, but there is no guarantee you will ever find someone to overrule a computer that won’t price an award. Yes, you are reading that right. The return is Lima to Houston to Los Angeles to Santa Barbara (stopover), Santa Barbara to Phoenix to Newark. The return goes west then east within the US. And yet the itinerary prices at 40,000 miles, which is the normal coach roundtrip from the US to Peru. Santa Barbara to Newark is a free oneway. Can you rebook now that you’ve read this article to add a free oneway? Yes, but it will cost you $75 or more. United’s award fees’ list says that changing the origin/destination costs $75–less if you have status. I believe that agents must decide without a computer the correct fee to assess, so I would lobby for the destination-change fee instead of letting an agent talk you into cancelling and re-crediting then rebooking for $150. A similar question is whether you can combine two oneway awards booked separately into a roundtrip to unlock the free stopover and thus the free oneway. That would cost $150 to cancel one and add it to the other. I haven’t talked about MPM, overwater carriers, or anything like that with respect to United free oneways because those concepts don’t apply. Each loyalty program has its own rules. United’s doesn’t worry about MPM for awards, and it has no crazy published-fare-from-overwater-carrier rule like American does. Free oneways have changed how I book United awards. United is awesome for allowing us to book oneway awards for half the price of roundtrip, so I used to use United miles for oneways because I often like to travel in circles instead of roundtrips. But since discovering free oneway, I try to book mostly roundtrips with United to unlock the stopover and two open jaws. And I try to avoid using the stopover on the main portion of the award, subbing in an open jaw and an Avios award if necessary, so I can save one open jaw and the stopover to get a free oneway. If you want to earn a quick 40,000 United miles, apply for the Chase Sapphire Preferred card, which has a 40,000 Ultimate Rewards sign up bonus after spending $3k in three month. Ultimate Rewards transfer freely at a 1:1 ratio to United, Southwest, British Airways, Korean, Virgin Atlantic, Hyatt, Amtrak, and more. Or you can use them for $500 in paid flights or gift cards. With your aforementioned Hawaii example, you can book a round trip award ticket with the outbound and inbound being different classes and pay miles accordingly? This is very interesting and well laid out. Thank you! Luggage could pose an issue. I have had agents refuse to check my luggage anywhere but through to my final ticketed destination, even on 24hr+ stopovers. Could be tough if someone is coming home with a big suitcase they can’t carry on and doesn’t want their stuff waiting in HNL for 4 months. What about trips originating from Hawaii? Does this apply to only international flights, or to flights to the mainland as well? Can I still have a stopover and oneway? And if I can have a oneway, where can the oneway be to? Embla, this doesn’t work if you originate from Hawaii. Eye opening! Thanks. Now I’m wondering if I should add a one way to my Bali award booked on Singapore during their computer shut down. I’d love to add another segment in first class, but I couldn’t live with myself if anything went wrong and I lost my round trip in Suites class. Any advice? In case you’re using this in your presentation, I think you have the wrong screen capture when you talk about using USAirways. They do indeed fly to Charlottesville (VA), but your image says Charlotte (NC). I believe Charlottesville is only served by Piedmont dba USAirways Express. That was the wikipedia screen shot for airports served from Charlottesville. All those cities, Philly, Charlotte, and Dulles serve C’ville. I have a one-way international award currently booked. What is the best way to add a return flight to the award and unlock a free one-way? Can it be done on United.com or only by calling in? Would converting the one-way award to roundtrip incur a $75 or $150 change fee or would it be possible to do this without a fee? You do bring up a good point about doing this online. I believe you could make the change online for $75 or $50, so I would start there. I am looking for flight from LAX to IST, IST back to LAX, and free one way LAX to HNL. The return trip from IST to LAX keeps showing only one flight and only coach saver avail, when i do separate one way searches from IST to LAX I get a bunch of different business award availabilities and flights. Why is this and if I call in United would I be able to choose one of those. Also thank you for all the great and informative blog posting, much appreciated. Yes, call and you will get all the choices you should. This is the multi-city glitch I was describing in the post. See the section about Palm Springs and Hong Kong. I also have another question. I have a rt from LAX to SGN in January and a RT from LAX to LHR in April. I know I can do a free one way from LAX to RIO in August but how can I get a free return from RIO to LAX by utilizing my free one way on my LAX-LHR trip. You can’t. A cheap oneway TO LAX would have to be BEFORE the main award. TO/BEFORE and FROM/AFTER. Love the article. I am currently 1/3 through my current booking and enjoying Italy. I’m headed back to the us in 5 weeks and have a “free” ticket booked to Hawaii in April. I went in to the united website to see if I could change some of my plans only to see that my 2 hour layover to hnl is now 21 hours. Now I did not agree to the new scheduling and I wonder if I call in to cancel that leg only, if they will credit back 32,500 miles. This would effectively make my round trip to Europe 30,000 miles in coach saver. I think the middle leg of my trip is actually the free one so I think what I am saying holds true. Wondering if I should also wait untill I complete the 2nd part back to the us before calling to cancel it. My other idea was to head from Italy to Asia back to the us, which I believe I could do without change fees due to the schedule change and only for 2,500 more miles as I initially found a us-Europe-Asia-us for 65,000 miles in coach saver. Please let me know if you know anything about this as I just added the Hawaii leg down the road without actual plans. Anyone else with a similar issue also. Thanks!! If you want to try to cancel Hawaii and get 32,500 miles back, wait until after the return. If you want to try to come back through Asia, call now. Let me know the resolution please. I am very interested in United’s response to your requests. They say that once an itinerary has started, no refunds on miles (only taxes), even in the event that they had a rather large schedule change. I spoke to the supervisor or whomever is the highest level person you can get on the phone, and they said there is no way around it. However, this has become a problem as when I first called a week ago, the customer service rep told me I COULD get the miles refunded, no matter how hard I tried to get a specific number they could not provide it and they assured me that I would receive a refund for the miles between CLE-HNL. Miles never posted which I why I called back only to learn the 1st rep was completely wrong. I have left a VM on their cust feedback line and awaiting response. CLE-HNL on its own is 20,000 miles, so I am claiming that I am ‘missing’ that many miles. Any further advise aside from follow up calls? That’s a fair demand from you. But it is not true that once travel begins no changes are allowed in my experience. Maybe the second rep was wrong. They could change it they said. But they could not refund the unused portion. The first rep thought she could and all it did was refund taxes. I haven’t checked the fine print but I’m hoping to get to the bottom of it. Any idea how to add ROC – COS leg at the end for next May? All I see on line is to change the current reservation, which would seem to let me add a final leg, but would also force me to change my FRA – ROC portion. Is this something I would have to call in to add? Lastly, since the last portion of my current ticket is Economy (single-cabin flight), safe to assume that would mean my “free oneway” (if I can get it) from ROC – COS would be Economy even though my “main” ticket is “Business” where available? DUR-JNB-SIN (on SIA) stopover in singapore. I was charged $220 for taxes/fees. Sounds like a great deal indeed. But, I do not like the long cold flight from SFO to London(LHR) In particular, I had to wait 7 hours in LHR for the South African airline to fly from LHR to JNB. UA would not allow saver award for SFO-JFK-JNB. ( UA 824) and then UA 7916 from JFK to JNB(operated by SA). Using this route would save me 10 hours of traveling time. Can anyone help me secure this flight or give some advice? have tried numerous times and united website craps out everytime….should I put the hawaii first on hold and call united to add third flight? You can try calling, but I don’t think you’ll ever get that booked. That’s such a circuitous routing from Newark to Seattle. but isn’t it similar to EWR-EZE//EZE-EWR//EWR-ORD? can you please explain a little more? eze-ord is the return on that itinerary. and eze-ewr-ord is a very logical way to make that journey without backtracking. your example from hawaii goes hawaii-east coast-west coast, which is a backtracking way to get from hawaii-west coast that adds 5k miles to the trip. GREAT article!!!! I have read this so many times my eys are crossing. Is this a possible route on United for 55k in business? Would I have a free one way or open jaw I can add? So I’m looking at redeeming UA miles for PTY-ORD, one way for 17.5K miles in Feb. I don’t know of any other trips I’ll be taking in the future except for maybe ORD-LAX-ORD in May. Do I have any options of add-ons or do I just book the one way by itself? Probably, but impossible to say in advance because United is not 100% consistent. I currently redeemed my AA miles for March 7, SFO-MBJ and March 13, MBJ-SFO. Would it be possible for me to add a free one way? If so, how? Also, if I already booked it, will I still be able to add the free one-way?? No. AA awards to the Caribbean don’t allow for stopovers. No. No stopovers on oneways. Just a quick question about this. I am headed to Hawaii in May (DEN-KOA-DEN) and want to tack on a free oneway to Dulles at the end of the trip. However, I really want to do the DC trip in April of next year, which isn’t available yet. What is my best way to do this? Does United charge a fee to change the free oneway portion at a later date? Remember that all award travel must be completed within one year of booking, so if you want a flight in April 2014 as part of the award, you must book April 2013 or later. You can make changes to the date on United awards for free if you are more than 21 days away from the old and new date. Question on United Award bookings (as a leg of a roundtrip award).. can you construct your own routing that isn’t showing in the results? For example, flying ZRH-PDX and results do not show routing through JFK at all. Does that mean you wouldn’t be able to fly ZRH-JFK-PDX (which is actually ZRH-JFK-LAX-PDX I believe)? I’m trying to find a creative way to get on Swiss Business on the return but all of the routes ZRH-PDX have the transatlantic flight operated by a partner and not Swiss. Hoping that makes sense…. Just to be clear, I mean that they are not showing with any Saver award availability (ZRH-JFK-PDX for example). But if I search the legs separately they DO have availability, so can I call and have them put that together as a Saver route? Any Idea to maximize a oneway Nyc-mex? On a oneway, you get no stopovers, so there is no way to maximize this trip other than enjoying it! After frustrating myself like crazy at united.com, I’m reaching out for help. I think the answer is trying to do an open-jaw in the middle isnt possible, but any clarification you could provide would sure help! My point is getting to RIX but then trying to stop by a two spots on the way back (minus the positioning flight intra-europe. Please help clarify why united wont let me do this! Thanks for your time. You have to call that one in adam. It will work but united’s website glitches out so you should begin booking a trip as a one way (book iad-rix), then when you get to the payment screen (don’t pay at that point) there is an option to CALL IN to pay with credit card, when you do that, say you want to make it a multi-destination ticket and provide dates and flight numbers for the other 2 segments (as always look up the flights individually so you know there is availability), what you are describing is perfectly within the rules with an open jaw then a stopover. It’s annoying you can’t just do it online, but just hope for a competent CSR and they’ll take care of you, if they can’t, hang up and call again. Yes, you can’t do an open jaw in the middle. That’s a hole in your itinerary. Thanks so much for responding. Time to go work on plan b.
I was tinkering with this today. Here is what I found. All coach travel. One question: I believe you can change dates on United without penalty. Is this correct? If it is, do you have to use the final leg of your trip one year from the date it was booked? You can change the date for free 22+ days out as long as airline and routing is the same. No matter what, you get one year to fly the award. Great information! Thank you so much.. Booked IAH to OGG RT for July, 2013, then added on a one way to RDU for Sept. Great use of miles! I live in Cedar Rapids and want to travel to Australia. No. It would be 110k. Can I add a free one way in there ? thinking AUS-LAX 11/27? All three legs show availability but the system doesnt let me price them.. Am I missing something or is this invalid routing for some reason? Call and do it by phone. United.com doesn’t always work well. Be persistent on the phone. I am flying a very similar route to David’s around the world, starting from the US (I would consider both SFO and BOS to be my home airports, so I can be flexible in that respect). Is that even possible on one award ticket, or am I doing this wrong? Is there a better route to take? Thank you so much for writing this article! Super informative, I hope I can put it to great use! I am planning a trip to Japan and Korea and would like to know if this is possible on one United award ticket? Is it possible to keep the origin/destination of the free oneway the same and change the date/time without a fee? The fees are for changing origin/destination, the date within 21 days, the cabin, or the airline. If you just change the day more than 21 days out, you’re fine. My home airport can be EWR, JFK or LGA. Basically can a round trip to Singapore qualify for a free-one-way to Hawaii? Thank you so much! Is it possible to have a open jaw and stopover in USA from international flight originating from outside USA? eg: SIN>SFO (open jaw) SJC>NYC (stop), NYC>SIN. I get error after choosing 1st segment. If I change SJC to DEN , I get error after two segments. Are they will charge me $75 change destination fee? KBP and LWO in the same country. Yes. But that fee is charged by an agent, so the agent might not notice or remember. You can try to call several agents until one forgets. Thanks for the informative article. I am trying to book the following award travel but keep getting an error message after selecting the first segment. Is this an eligible itinerary? Does the free one-way award need to be a certain amount of time after the second segment of the trip? Can I add RSW to BOS in Sept as my free one-way? No. You get one stopover. Adding a free oneway would create a second stopover in RSW, since you have one in PEK already. What if you live in Alaska? It priced out at 90K miles (rather than 80K for the roundtrip plus 20K for the one-way to Lima) properly. Now, United completely screwed up the first leg (stranding me in YUL along the way), and calling in to ask them to fix it prompted them to claim the routing was illegal and that any voluntary change will cause them to charge my account for the additional 10K miles. I’m going to call back in to try to get a more knowledgeable (and less cranky) phone rep, but any other suggestions to get my heart rate back down? Ask them to show you which rule it violates. Since they can’t, ask them to make the changes you want without threatening to charge you more miles. Thanks for the response. The angry rep (and manager) made unilateral changes to the itinerary without my permission—they asked, “Can I make this change?” to which I said “Absolutely not, I will call back after I review my options.” They made the change anyway. Thankfully, they didn’t also unilaterally charge my account, and upon calling back, I found a rep who was helpful in making additional changes while remaining pleasant (not bullying). Sheesh. Maybe you’ve already mentioned this, but it seems like an epiphany to me so I thought I’d share. United’s computer is effectively pricing this out as two one-ways. That is, in my itinerary above, the agent saw a round-trip to Europe (80k, with one way being in business), plus one-way LAX-LIM in the winter (20k) for 100k. The computer saw a one-way to Europe in business (50k), plus a one-way BRU-LIM (with a three-month stopover in Los Angeles) (40k) for 90k. So if I get this right, I can book a multi destination like the following: SFO to Osaka, Tokyo to SFO, then get a one way from anywhere in the US to SFO? Or does it have to originate from SFO? Oh by the way, I couldn’t find the “phone order page” when I tried to hold my reservation because doing the multi-destination bascially eliminated all the good flights I found when doing the one-way. I called in and told the agent that the multi-destination didn’t work and he just dropped the 25 dollar booking fee for me. Worked great, got a SFO-Osaka, Tokyo to SFO, and SFO to Chicago for 65000 miles and 48 bucks! This is gonna totally change how I book tickets now! Looks like UA agent had a training course over this and they refusing to add stopover within continental US ……. @Sahib, I just got off of an EPIC reservation call with a similar situation. In my case, I’d approved the booking over the phone at the proper price, but the booking agent entered it at a much higher price. When I got on the phone later to clear it up, THAT agent didn’t understand that the stopover was legal and thought that’s why it was pricing out that way. She and her supervisor both told me that you weren’t allowed an open jaw and a stopover on the same award … which is nonsense of course but what was I to do? I had to actually reserve another one, similar but different dates, online and show her the booking so she’d believe the price. That kind of situation screams “hang up, call back”, but as it turned out that wouldn’t have helped. The stopover wasn’t the problem at all. The problem was that the original booking agent booked the final “free” segment as a standard (not saver) award. That hadn’t even occurred to me since the original booking agent had quoted me the correct price. I seriously DON’T think this is a case where the rules are changing to disallow domestic stopovers. I think I just got two oddball agents — one who quoted me one price and then booked me at another, and another who didn’t understand the routing rules. I booked 2 first class oneway tickets using AA miles. syd-lax-ord-stl (the sydney -lax portion is on qantas). can i combine them into a round trip ticket? and does aa or qantas allow me to add mel-syd for free? You cannot stop add mel-syd if there would be more than 24 hours between it landing and the next flight taking off. for only 65K UA miles and tax! I wrote about it on flyertalk.com but never again could I find the option to return from the US to BKK via Australia again–perhaps I alerted UA to this loophole by my post or subsequent lengthy discussion with a phone agent. It looks like the “phone order” option has disappeared . At least it is not available to me. I guess paying the $25 is still better. I cant even do a 23 hour layover or routing that I want without it. Any advice. I checked each segment separately (one way awards) and found dates with saver awards. When I use multiple destinations I always get an error. I’m wondering if the problem is that TPE (North Asia) to OGG (Hawaii) is less miles than TPE to SFO (US) so I can’t have a “stopover” in SFO. Has anyone else gotten a US -> Asia, Asia -> US, US -> Hawaii to work? I don’t think they’ll let you go TPE to OGG via SFO. That’s quite out of the way. Call in to give it a final shot. Is the Caribbean-US-Europe deal dead now? Let me explain what I mean. I realize that you can still tack on a “free one-way” ticket to the Caribbean when travelling from the US to Europe, but I can’t seem to get it to price out to where it is saving me 2,500 miles over travelling direct from the US to Europe. With the stopover being in Chicago for several months. Mainland US to Europe appears to still be pricing out at 30k miles each way, but Caribbean – Europe is showing up as 35k for me – not only is it not showing as 2,500 miles cheaper than US – Europe, but it is coming out as 5k more. I called United to try to book CDG-ORD-MBJ, and they quoted it as 35k as well, and said that while many routes have increased in recent years, the Caribbean-Europe route has been 35k for several years. Was the rep I spoke with mistaken, and this is a recent change; or is there a workaround I am not catching? Last year I was able to book LAX to EWR in April then EWR to LHR in July and MUC to EWR in August for 60k by calling (couldn’t do it online). Now I am trying to do this: PHX to Hanoi, Bali to EWR and EWR to PHX. Do you think this is doable if I call? Just want some advise before I do. So with the UAL website not allowing me to process (or even view) the legs, is the best advice to look for each segment first to make sure it’s available (e.g. the international award), then call the CS agent to book all 3 legs with them..the roundtrip and the one-way add on? Has there been any pushback from reps re. adding the domestic (free) one-way? I can verify that, as of last October anyway, you can change the free one way after taking all other legs and pay only the standard change fee… If any at all.